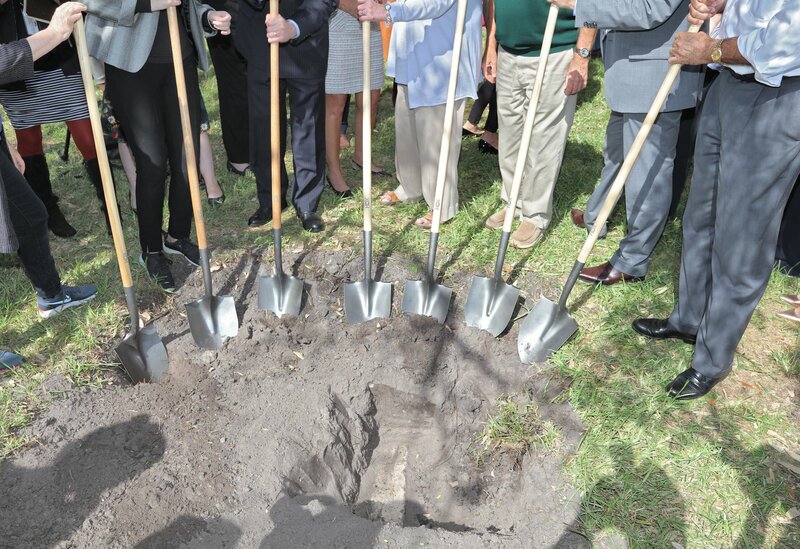 The Museum of Fine Art in St. Petersburg, Florida, has rediscovered two ancient mosaics from Antioch that for reasons unknown were buried under the east lawn behind the sculpture garden. On March 7th, they were excavated and, along with three other Antioch mosaics in the museum’s collection, will be conserved in full view of the public in an outdoor conservation laboratory on the east lawn. The ancient city Antioch, modern-day Antakya, Turkey, stood shoulder-to-shoulder with Rome, Constantinople and Alexandria as one of the great metropolises of the Roman Empire. Part of the Syria province, one of the richest of the Eastern Roman Empire, it was founded in the 4th century B.C. by Alexander the Great’s general Seleucus I Nicator. It became the capital of the Seleucid Empire and continued to be a center of Hellenistic culture long after the collapse of the Seleucid dynasty in the 1st century B.C. Its mosaics are outstanding examples of Hellenistic art. At a time when the fashion in the Western Roman Empire was for black and white mosaics, the trend in Antioch was for a pictorial, colorful style with narrative depictions of scenes from mythology, prismatic rainbow effects and complex trompe l’oeil 3D patterns that mimicked naturalistic Greek paintings of the time, very few of which have survived. Even as traditional Greco-Roman polytheism was replaced by Christianity, brilliant color, pattern and naturalistic figures (animals and florals replacing scenes from Classical mythology) still flourished in the city. 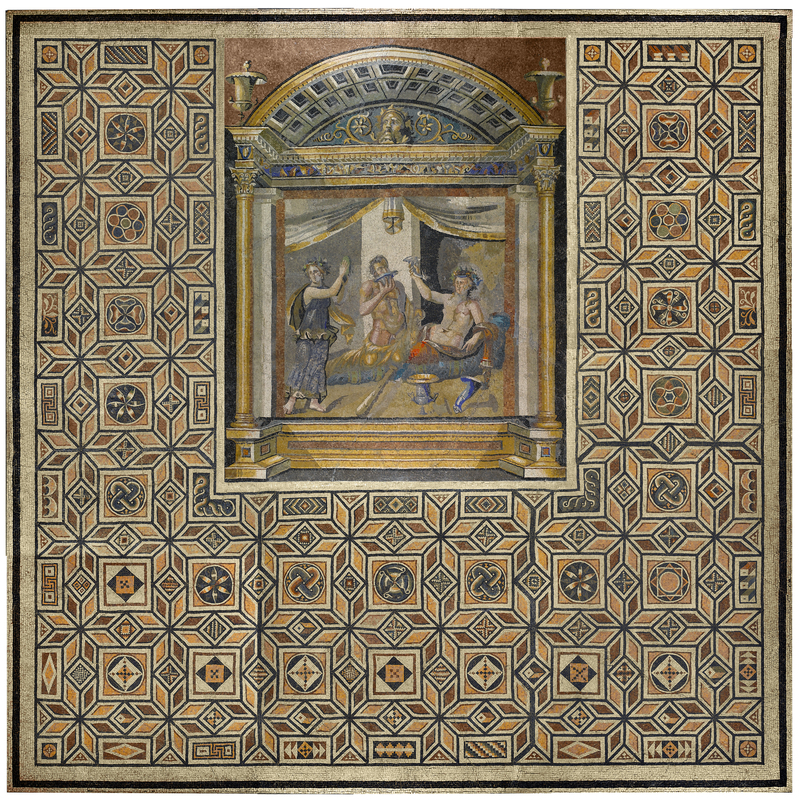 Roman Antioch produced exceptionally high quality mosaics from the beginning of the second century A.D. until the destruction of the city in a series of earthquakes between 526 and 528 A.D. 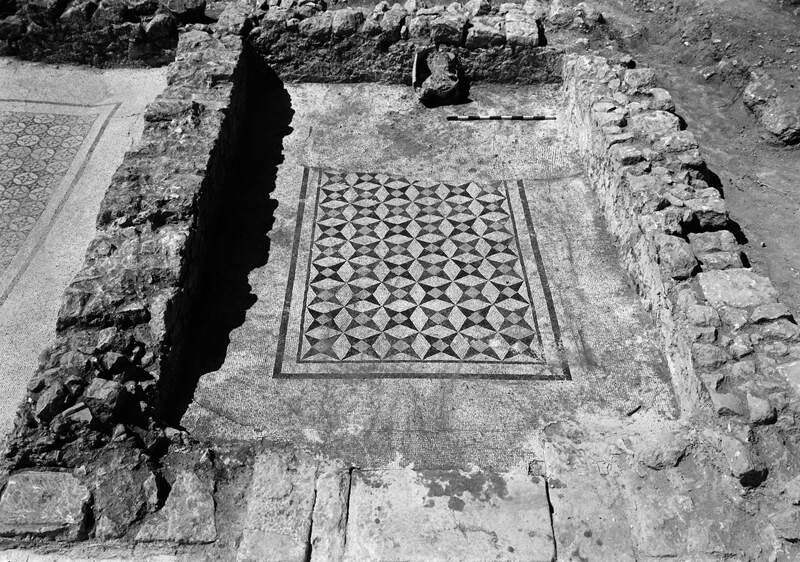 Between 1932 and 1939, Princeton University archaeologist George W. Elderkin, directed yearly excavations at Antioch and its environs during which hundreds of mosaics were unearthed. As was typical at the time, the right of excavation granted by the Syrian Antiquities Service also stipulated to a partage (meaning division or sharing in French) system as regards any recovered artifacts. The sponsors, in this case Princeton University, the Worcester Art Museum, the Baltimore Museum of Art and the Musées Nationaux de France (ie, the Louvre), would be entitled to a portion of the finds, including the mosaics. The excavations ended in late 1939, before the contract was up, due to the outbreak of World War II and the secession of Hatay province from Syria. It was annexed by Turkey, which had far stricter laws regarding the export of antiquities and obviously was not bound by the terms of the Syrian excavation concession. After a tense negotiation with the new bosses, the partage system remained in place, only the government of Turkey got what would have been Syria’s share. Many of the raised mosaics from the Princeton Antioch excavations of the 1930s are now in the Hatay Archaeology Museum in Antakya. Their share of the artifacts were divvied up among the sponsors. Princeton University got a large number of the finds, not just mosaics, but also sculpture fragments, terracotta figurines, lamps, glass and pottery vessels, jewelry, bronze, bone, ivory and iron tools and decorative elements and some 40,000 coins. Some of the mosaics were installed in various university buildings and the Princeton University Art Museum. The library got the massive coin collection. Much of the rest, 300 boxes and trays worth, was placed in storage. Over the years, Princeton sold some of the Antioch pavements to other institutions. The Museum of Fine Art in St. Petersburg bought its five from Princeton in 1964, one of the first acquisitions of the museum before it was even open. (It would open to the public in the Spring of 1965.) Two wound up on display, one in the Membership Garden, one embedded in a fountain in the Sculpture Garden. One was placed in storage under the stage of the Marly Room. The remaining two were buried under the east lawn in 1989. While this choice was documented at the time, there are no references to the reasoning behind it, and people just sort of forgot about the two priceless Antioch mosaics under the lawn. That changed with the appointment of Kristen Shepherd as executive director of the museum in January 2017. She had studied in the Membership Garden when she was a high school student and had fond recollections of the mosaic installed there. When she took up her new job, she researched the mosaic and was delighted to find there were another four from the Antioch excavations in the museum. She quickly found the one in storage and the one in the basin of the fountain and the records of the burial of the two remaining mosaics. The records were sparse, however, and didn’t include the precise locations. 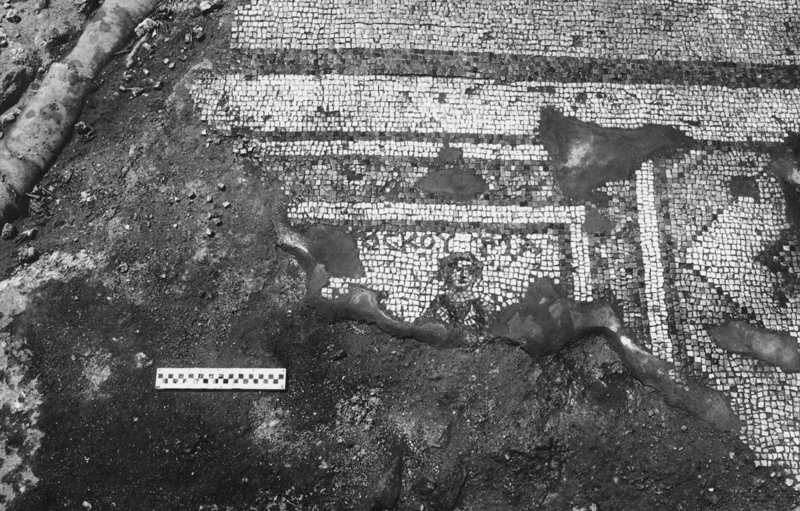 Shepherd sought out former directors and museum staff to see if they had a better idea of where the mosaics had been buried and last year a test pit was dug which revealed the corner of one of the two. She also started fundraising, creating the Antioch Reclaimed: Ancient Mosaics at the MFA project to conserve the mosaics and reinstall them in a manner befitting their archaeological and artistic significance. The March 7th excavation, which required heavy equipment to lift the mosaics on their reinforced concrete beds, also discovered an additional fragment from the fountain mosaic that had not been recorded. 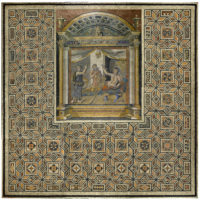 Of the two buried mosaics and the largest of the five came from Room 4 of the House of the Drinking Contest, named after the spectacular mosaic pavement of Room 1, now in the Princeton University Art Museum, whose central panel depicts Herakles and Dionysus knocking back the gifts of the vine. 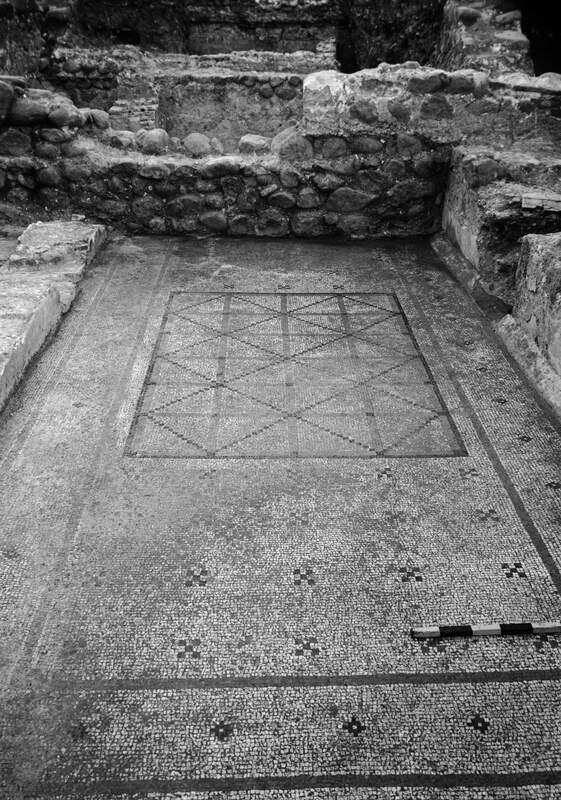 It comprises most of a rectangular floor decorated with a geometric pattern of four-pointed stars. The second is a rectangular panel raised from the East Portico of the House of the Evil Eye. It is a geometric piece as well, featuring diamond shapes over a grid pattern. Of the three remaining fragments, two are also geometric and one has a figure and an inscription in Greek. The figural piece was raised from Room 20 of the House of the Menander. 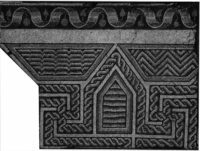 From Room 1 of the House of Ge and the Seasons comes a fragment with an elaborate combination of guilloche and meander patterns that was part of the border of a pavement mosaic. 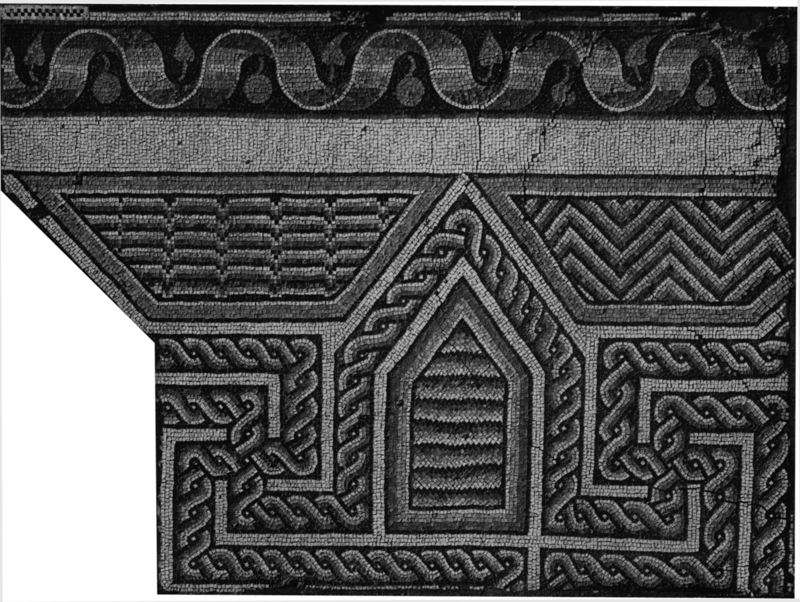 The last of the five came from Room 5 of the House of Iphigenia and is also geometric border, this one depicting cubes in one-point perspective. All five of the mosaics are generally dated between around 100-300 A.D. and are made of limestone and marble tesserae. The Antioch Reclaimed project will proceed in three phases. 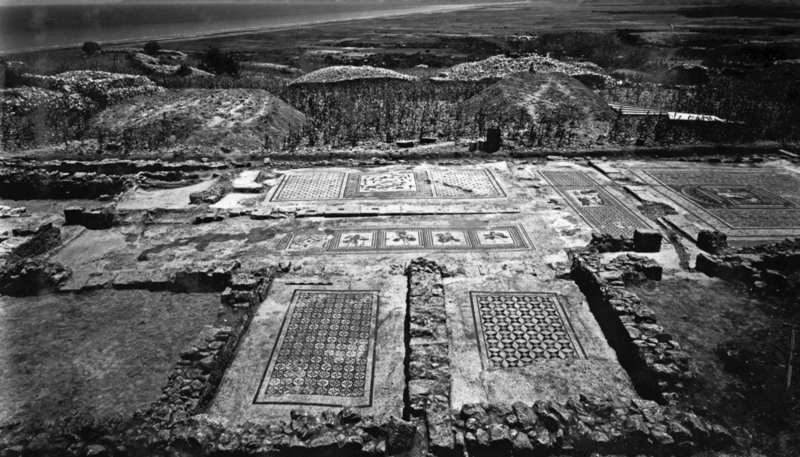 The first is the excavation of the mosaics from the garden, the raising of the one embedded in the fountain and the cleaning and conservation of all five mosaics in the outdoor laboratory. Once the mosaics are looking their best and have been stabilized, in phase two they will go on display in a temporary exhibition that explores their history as part of the Hellenist tradition of mosaic art. That’s scheduled for the Fall of 2020. Phase three is their permanent installation. The site hasn’t been determined yet, but the Membership Garden is due for a renovation and they could well end up there, although I hope in a more protected and conservation-appropriate environment than the old setup. The museum doesn’t all have the funds needed to complete all three phases yet, but they do have a $50,000 matching challenge on the table right now, so now’s a good time to donate, if you’d like to support the project. To donate any amount, click here. If you donate $50 or more, you’ll get a behind-the-scenes tour of the mosaic under conservation led by Michael Bennett, senior curator of early Western art. The tours are being offered on March 23nd and 24th at 11:30, 1:30 and 3:30, so if you want in on this, you don’t have a lot of time. If you think embedding a mosaic in a fountain or burying a couple in the garden is a less than optimal way of treating an ancient artifact, then consider the example of Princeton itself which took an even more opprobrious approach to one of the Antioch fragments it did not sell off. It was installed on the exterior threshold of the entrance to the Architecture Laboratory in 1951 where it was pummeled by the New Jersey elements and the tromping of thousands of feet for six decades. When, as was inevitable, the tesserae were dislodged or loosened, layers of cement were slapped on top. It continued to be brutalized in this manner until finally in 2011 it was raised and conserved. Significant portions of it were lost beyond repair. This video shows the whole process — the raising, conservation and its final installation on an indoor wall in the School of Architecture. This entry was posted on Sunday, March 18th, 2018 at 4:47 PM	and is filed under Ancient, Museums. You can follow any responses to this entry through the RSS 2.0 feed. You can skip to the end and leave a response. Pinging is currently not allowed. Wow. That is really strange. I hope the mosaics will be treated properly from now on! So many mosaics, so little space to display them. My sisters and I used to day trip to The St Pete Art Museum when we were teenagers (in the early 70s). There was a Renoir on loan there. We used to say we were going to visit ‘our’ Renoir. Thanks for the memories! Not alone that there has a St. Petersburg been discovered in Florida ..there are mosaics from Antioch too? ..Gosh! What else might still be buried down there? The Amber Room? Señor Trump’s tax declaration? Atlantis? I’m sure we’re all falling off our chairs at your injection of a political comment in this history blog. Another reason to revisit the Worcester Art Museum; it’s been a while since I got out there.